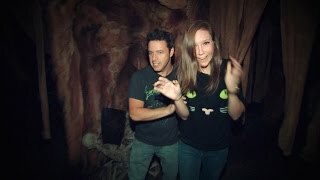 "Brave" may be the wrong word, but Ellen's Executive Producer, Andy Lassner, and his assistant, Jacqueline, made their way through a haunted house. As one of her annual Halloween treats, Ellen sent her Executive Producer and his assistant through a brand new "Exorcist"-themed haunted house! 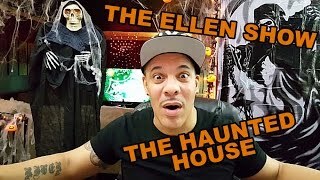 Andy the producer of the Ellen show visits the haunted house and well it's something you have to see (super funny). Credits : The Ellen Show. Andy and the music star had a spooktacular time during their visit to a creepy haunted house for Halloween! For her birthday, Ellen asked Andy and his assistant, Jacqueline, to try an exciting new experience, and the cameras followed! Taylor Swift in the Haunted Hallway! Taylor doesn't do very well with scares. Ellen sent Taylor down the Haunted Hallway. Watch her reaction here! Watch the whole episode Thursday, October 25! Ellen showed some hilarious scare videos from the world wide web, and a few she made herself with this very scary new friend. 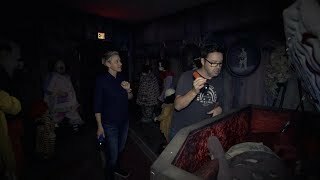 Ellen usually sends Andy to a haunted house, but this time around, she joined in the fun for a tour of the "IT" haunted house on the Warner Bros. lot.